Star brite® Premium RV Polish with PTEF® is specifically formulated to add full season protection against dirt and grime while also helping to block UV rays that cause fading. It delivers an easy-to-apply, high-gloss, long-lasting shine to all fiberglass, painted surfaces and polished metals. Start by washing surface to be treated with Star brite® Premium RV Wash or RV Wash & Wax and allow to dry. Shake bottle before using and then apply a quarter-sized amount to a clean, soft cloth. Apply to surface in a circular, overlapping motion to ensure complete coverage, working in areas about 18” by 18” at a time. Polish works while wet, so reapply to cloth as needed. For best results, do not apply in direct sunlight or when temperature is below 50°F. Star brite® Premium RV Polish with PTEF® will quickly dry to a haze. Buff lightly with a soft, clean cloth or microfiber to reveal a deep, durable shine. Dirt, droppings, grime and grease will not stick to treated surfaces. 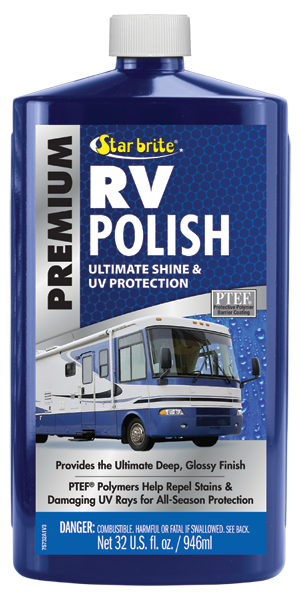 Use Star brite® Premium RV Guard Speed Detailer & Protectant with PTEF® periodically to extend the life of polish and to enhance the shine, plus as needed to spot clean light grime, bug deposits or bird droppings.